"Everybody’s gone out of their mind." Yes, it certainly looks that way as we get out first return trip to George Miller’s post-apocalyptic, road-rage-driven universe last seen in Mad Max Beyond Thunderdome. The faces might be different – with Tom Hardy subbing in for a much older Mel Gibson at this point – but the physicality and the muscle-car madness that has made the Road Warrior series so memorable seem to be dialed up to extreme levels. More than anything, though, this trailer for Mad Max: Fury Road makes the long-anticipated sequel look strangely beautiful. It’s almost as if George Miller pulls some of the visual wizardry he learned on the animated Happy Feet movies over to the normally bleached-out world of the Road Warrior, injecting the bone-crunching vehicle scenes with an array of wild colors that only enhance the excitement. This trailer is mad. And I don’t say that as a pun on the title, or the character. 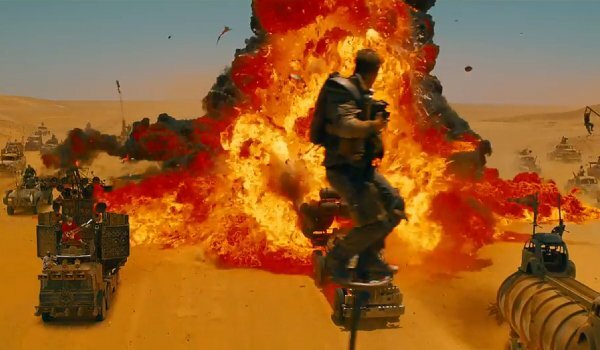 It truly is batshit crazy, an insane dash across a burning desert that has the fabric of the original movies intact, but seems to take full advantage of the new filmmaking tools at George Miller’s disposal. 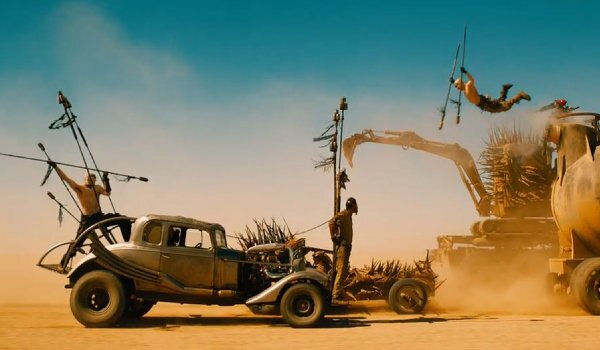 From what we are hearing, Mad Max: Fury Road is one long car chase scene. Like, that’s it. The whole movie is a car chase, from start to finish. But when that explosive chase has scenes like this, how can one complain? Tom Hardy takes over as the lead role of Max in this new sequel. Charlize Theron and Nicolas Hoult are unrecognizable as denizens of George Miller’s demented imagination. Fury Road looks like a straight-up shot of adrenaline through your veins. It hits theaters on May 15, 2015, so I know full well where you are going to be on that day. See you there.